The award recognizes Marcus’s fundamental contributions to the understanding of how people behave within the groups to which they belong and how they are affected by those groups, which include naturally formed cliques and friendships, organizational units, and self-help, therapy, and learning groups. On WSU faculty since 2011, Marcus has taught graduate-level courses on adult psychotherapy and adult psycholopathology and has published widely on these topics and others. His group research has applied the social relations model to understanding interpersonal perception in diverse groups including psychotherapy groups, juries, and fraternities and sororities. His other research foci include psychopathy and related disorders, such as antisocial personality disorder and conduct disorder. 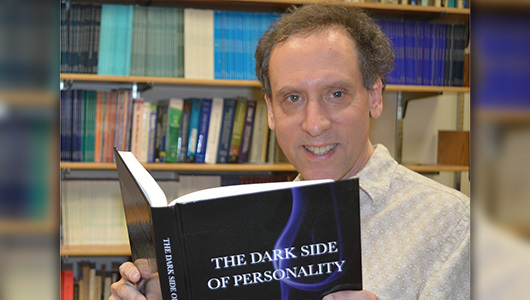 Marcus coedited The Dark Side of Personality: Science and Practice in Social, Personality, and Clinical Psychology published by APA in 2016. Last year, he was named a Division 49 fellow and is now finishing a four-year term as editor of its peer-reviewed, quarterly journal Group Dynamics: Theory, Research, and Practice. As editor, he is responsible for selection, review, and publication of original empirical articles, theoretical analyses, literature reviews, and brief reports dealing with basic and applied topics in group research and application across psychology and psychiatry and into a variety of other fields, such as sociology, education, communication and business. Top image: Marcus with his 2016 book.